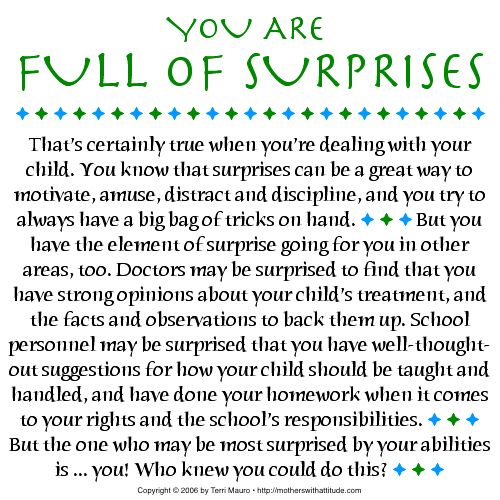 February can be a tough month for parents of children with special needs. Children react to the weather or the increase in academic difficulty at school or the disruptions of snow days and winter breaks and behave miserably. Specialist appointments and IEP meetings roll around. Extended family members, freed from the holiday requirements of fellowship and good cheer, get back to telling you what they think. 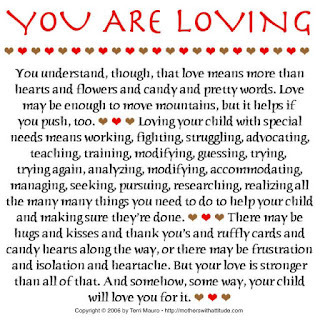 Even Valentine's Day can be hard, if you have a child who can't say "I love you" or doesn't want to hear it. Whether you're stuck in the winter doldrums or gearing up for a confrontation, stop by this page every day in February for some appreciation, affirmation and inspiration. And remember that, as hard as February can be, at least it's a short month. Feb. 1 ♥ YOU ARE STRONG. 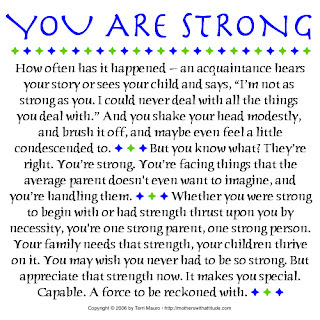 How often has it happened -- an acquaintance hears your story or sees your child and says, "I'm not as strong as you. I could never deal with all the things you deal with." And you shake your head modestly, and brush it off, and maybe even feel a little condescended to. But you know what? They're right. You're strong. You're facing things that the average parent doesn't even want to imagine, and you're handling them. 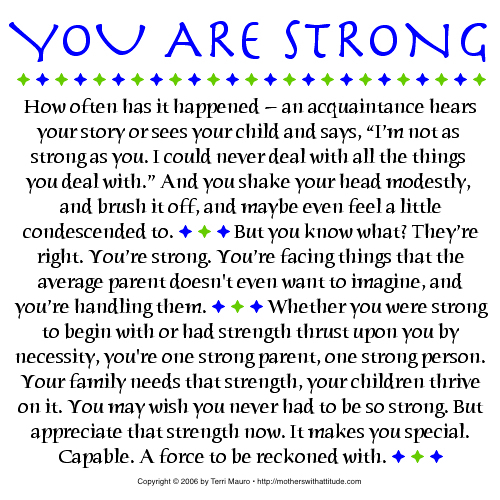 Whether you were strong to begin with or had strength thrust upon you by necessity, you're one strong parent, one strong person. Your family needs that strength, your children thrive on it. You may wish you never had to be so strong. But appreciate that strength now. It makes you special. Capable. A force to be reckoned with. Feb. 2 ♥ YOU ARE AN EXPERT. "Listen to us. We're the experts." Doctors, therapists, social workers, educators -- with their degrees and expertise, they may make you feel like your role in any discussion is merely to nod your head and sign off on their suggestions. 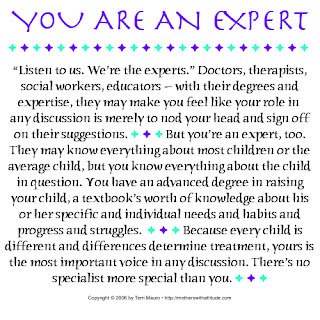 But you're an expert, too. They may know everything about most children or the average child, but you know everything about the child in question. You have an advanced degree in raising your child, a textbook's worth of knowledge about his or her specific and individual needs and habits and progress and struggles. Because every child is different and differences determine treatment, yours is the most important voice in any discussion. There's no specialist more special than you. 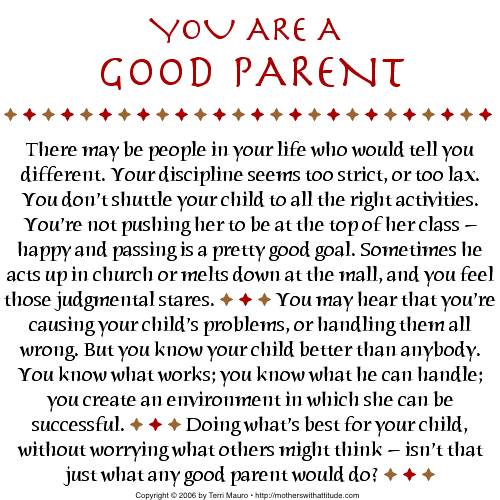 Feb. 3 ♥ YOU ARE A GOOD PARENT. There may be people in your life who would tell you different. Your discipline seems too strict, or too lax. You don't shuttle your child to all the right activities. You're not pushing her to be at the top of her class -- happy and passing is a pretty good goal. Sometimes he acts up in church or melts down at the mall, and you feel those judgmental stares. You may hear that you're causing your child's problems, or handling them all wrong. But you know your child better than anybody. You know what works; you know what he can handle; you create an environment in which she can be successful. Doing what's best for your child, without worrying what others might think -- isn't that just what any good parent would do? Feb. 4 ♥ YOU MAKE A DIFFERENCE. Your child's progress might not be that easy to see on a day-to-day basis, but when you reflect from time to time on how far he or she has come, give yourself some credit: Would that progress have happened if you hadn't been planning, praying, pushing for it? 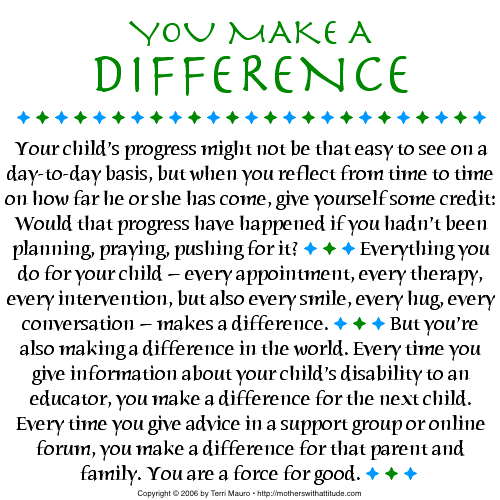 Everything you do for your child -- every appointment, every therapy, every intervention, but also every smile, every hug, every conversation -- makes a difference. But you're also making a difference in the world. 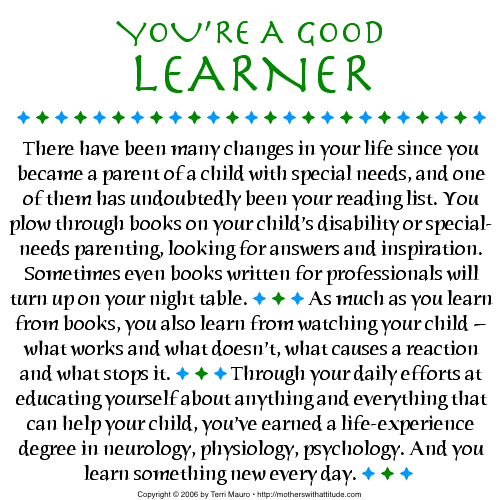 Every time you give information about your child's disability to an educator, you make a difference for the next child. 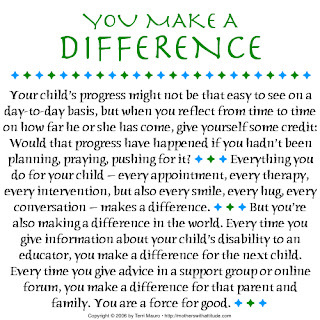 Every time you give advice in a support group or online forum, you make a difference for that parent and family. You are a force for good. Feb. 5 ♥ YOU DESERVE RESPECT. Goodness knows, you may not get it. There may be days when you feel Rodney Dangerfield had nothing on you. You may even decide that getting respect is not a battle you choose to fight, or something that's necessary for getting things done. 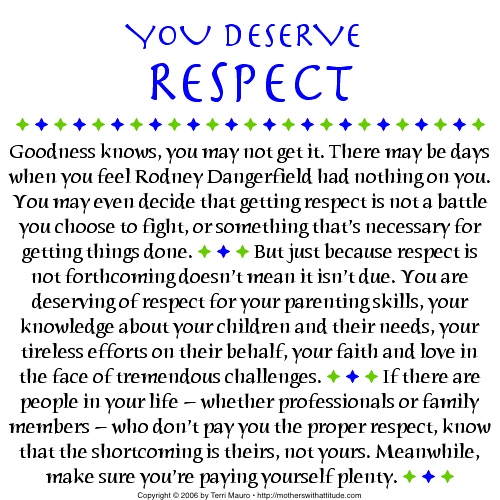 But just because respect is not forthcoming doesn't mean it isn't due. 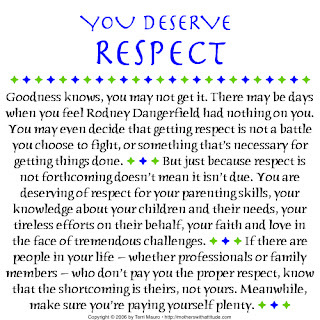 You are deserving of respect for your parenting skills, your knowledge about your children and their needs, your tireless efforts on their behalf, your faith and love in the face of tremendous challenges. If there are people in your life -- whether professionals or family members -- who don't pay you the proper respect, know that the shortcoming is theirs, not yours. Meanwhile, make sure you're paying yourself plenty. Feb. 6 ♥ YOU TRY HARD. 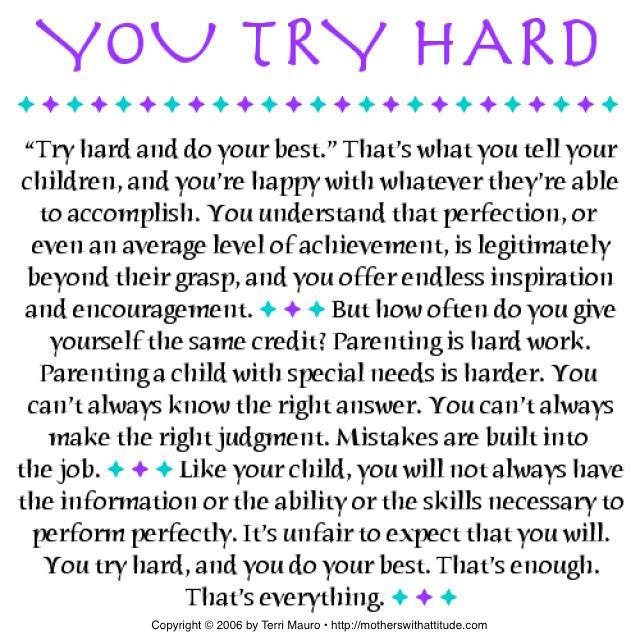 "Try hard and do your best." That's what you tell your children, and you're happy with whatever they're able to accomplish. You understand that perfection, or even an average level of achievement, is legitimately beyond their grasp, and you offer endless inspiration and encouragement. But how often do you give yourself the same credit? Parenting is hard work. Parenting a child with special needs is harder. You can't always know the right answer. You can't always make the right judgment. Mistakes are built into the job. 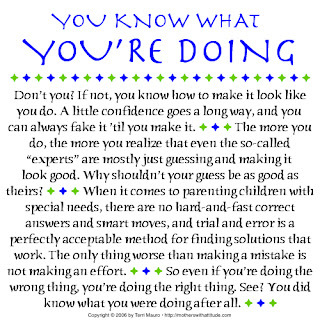 Like your child, you will not always have the information or the ability or the skills necessary to perform perfectly. It's unfair to expect that you will. You try hard, and you do your best. That's enough. That's everything. 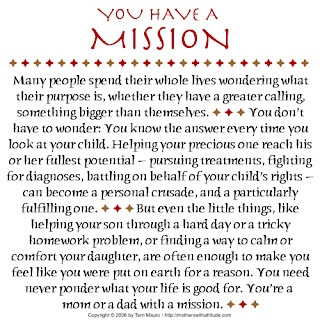 Feb. 7 ♥ YOU HAVE A MISSION. Many people spend their whole lives wondering what their purpose is, whether they have a greater calling, something bigger than themselves. You don't have to wonder: You know the answer every time you look at your child. Helping your precious one reach his or her fullest potential -- pursuing treatments, fighting for diagnoses, battling on behalf of your child's rights -- can become a personal crusade, and a particularly fulfilling one. But even the little things, like helping your son through a hard day or a tricky homework problem, or finding a way to calm or comfort your daughter, are often enough to make you feel like you were put on earth for a reason. You need never ponder what your life is good for. 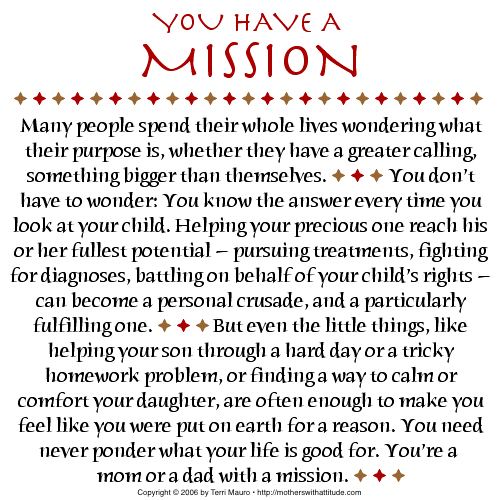 You're a mom or a dad with a mission. 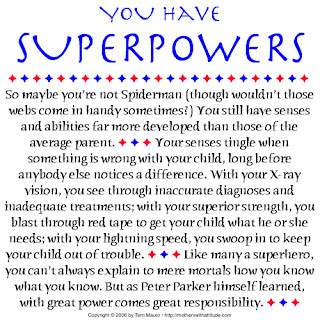 Feb. 8 ♥ YOU HAVE SUPERPOWERS. 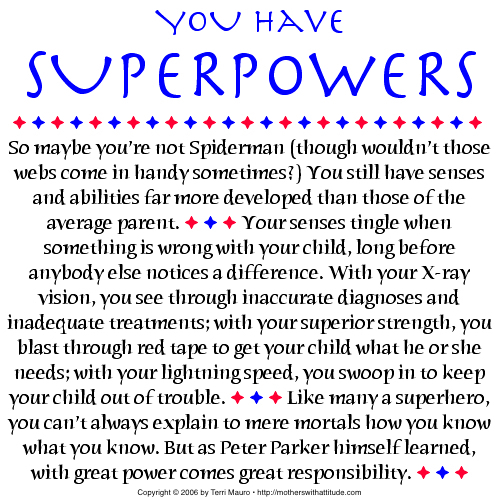 So maybe you're not Spiderman (though wouldn't those webs come in handy sometimes?) You still have senses and abilities far more developed than those of the average parent. Your senses tingle when something is wrong with your child, long before anybody else notices a difference. With your X-ray vision, you see through inaccurate diagnoses and inadequate treatments; with your superior strength, you blast through red tape and past ineffectual bureaucrats to get your child what he or she needs; with your lightning speed, you swoop in to keep your child out of trouble. Like many a superhero, you can't always explain to mere mortals how you know what you know. But as Peter Parker himself learned, with great power comes great responsibility. 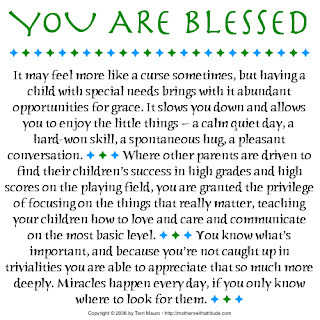 Feb. 9 ♥ YOU ARE BLESSED. 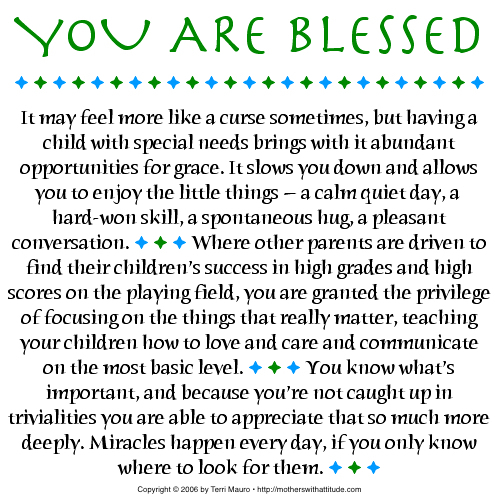 It may feel more like a curse sometimes, but having a child with special needs brings with it abundant opportunities for grace. It slows you down and allows you to enjoy the little things -- a calm quiet day, a hard-won skill, a spontaneous hug, a pleasant conversation. 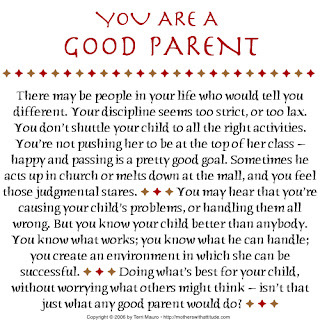 Where other parents are driven to find their children's success in high grades and high scores on the playing field, you are granted the privilege of focusing on the things that really matter, teaching your children how to love and care and communicate on the most basic level. You know what's important, and because you're not caught up in trivialities you are able to appreciate that so much more deeply. Miracles happen every day, if you only know where to look for them. 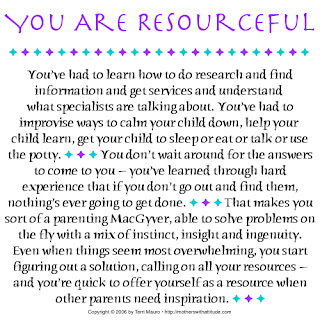 Feb. 10 ♥ YOU ARE RESOURCEFUL. You've had to learn how to do research and find information and get services and understand what specialists are talking about. You've had to improvise ways to calm your child down, help your child learn, get your child to sleep or eat or talk or use the potty. You don't wait around for the answers to come to you -- you've learned through hard experience that if you don't go out and find them, nothing's ever going to get done. That makes you sort of a parenting MacGyver, able to solve problems on the fly with a mix of instinct, insight and ingenuity. 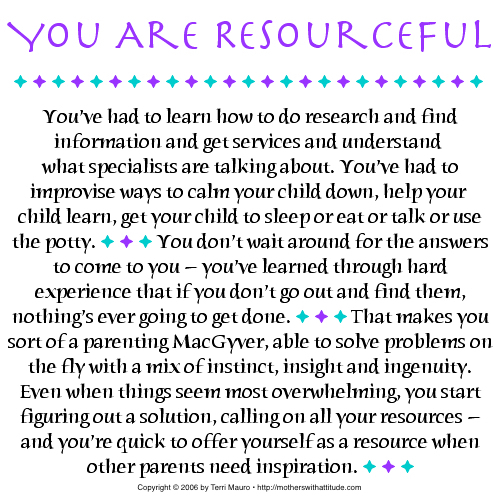 Even when things seem most overwhelming, you start figuring out a solution, calling on all your resources -- and you're quick to offer yourself as a resource when other parents need inspiration. 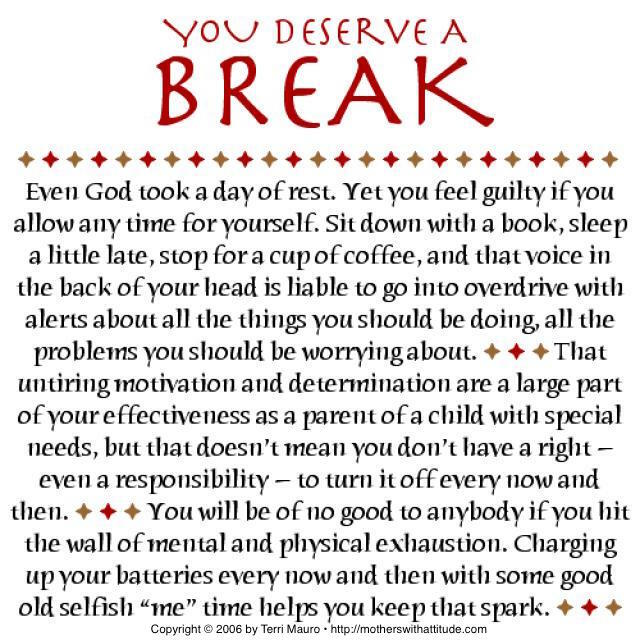 Feb. 11 ♥ YOU DESERVE A BREAK. Even God took a day of rest. Yet you feel guilty if you allow any time for yourself. Sit down with a book, sleep a little late, stop for a cup of coffee, and that voice in the back of your head is liable to go into overdrive with alerts about all the things you should be doing, all the problems you should be worrying about. 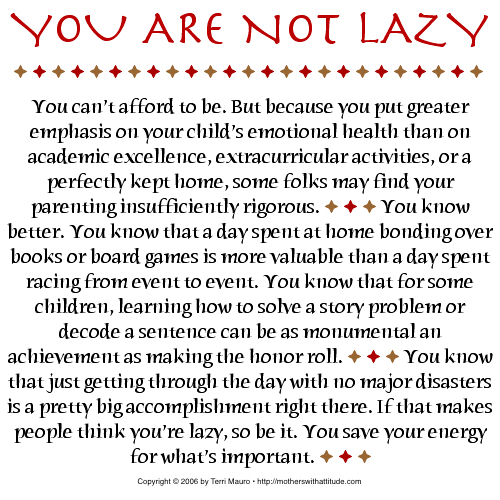 That untiring motivation and determination are a large part of your effectiveness as a parent of a child with special needs, but that doesn't mean you don't have a right -- even a responsibility -- to turn it off every now and then. You will be of no good to anybody if you hit the wall of mental and physical exhaustion. 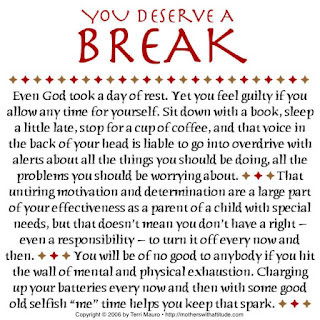 Charging up your batteries every now and then with some good old selfish "me" time helps you keep that spark. 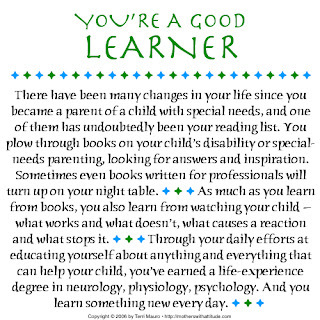 Feb. 12 ♥ YOU'RE A GOOD LEARNER. There have been many changes in your life since you became a parent of a child with special needs, and one of them has undoubtedly been your reading list. You plow through books on your child's disability or special-needs parenting, looking for answers and inspiration. Sometimes even books written for professionals will turn up on your night table. As much as you learn from books, you also learn from watching your child -- what works and what doesn't, what causes a reaction and what stops it. Through your daily efforts at educating yourself about anything and everything that can help your child, you've earned a life-experience degree in neurology, physiology, psychology. And you learn something new every day. Feb. 13 ♥ YOU ARE GROWING. 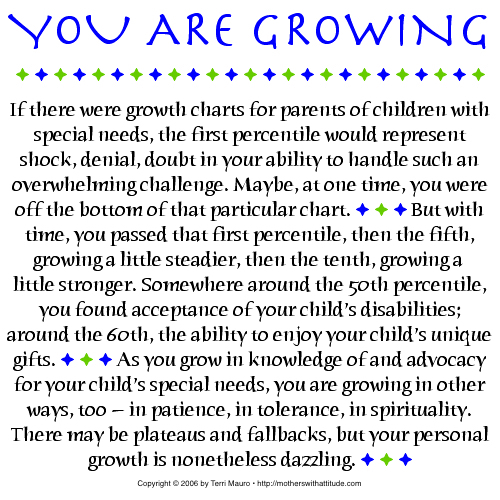 If there were growth charts for parents of children with special needs, the first percentile would represent shock, denial, doubt in your ability to handle such an overwhelming challenge. Maybe, at one time, you were off the bottom of that particular chart. But with time, you passed that first percentile, then the fifth, growing a little steadier, then the tenth, growing a little stronger. Somewhere around the 50th percentile, you found acceptance of your child's disabilities; around the 60th, the ability to enjoy your child's unique gifts. 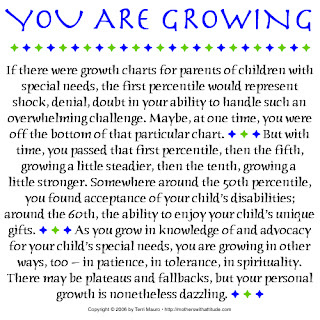 As you grow in knowledge of and advocacy for your child's special needs, you are growing in other ways, too -- in patience, in tolerance, in spirituality. There may be plateaus and fallbacks, but your personal growth is nonetheless dazzling. Feb. 14 ♥ YOU ARE LOVING. But you understand that love means more than hearts and flowers and candy and pretty words. Love may be enough to move mountains, but it helps if you push, too. 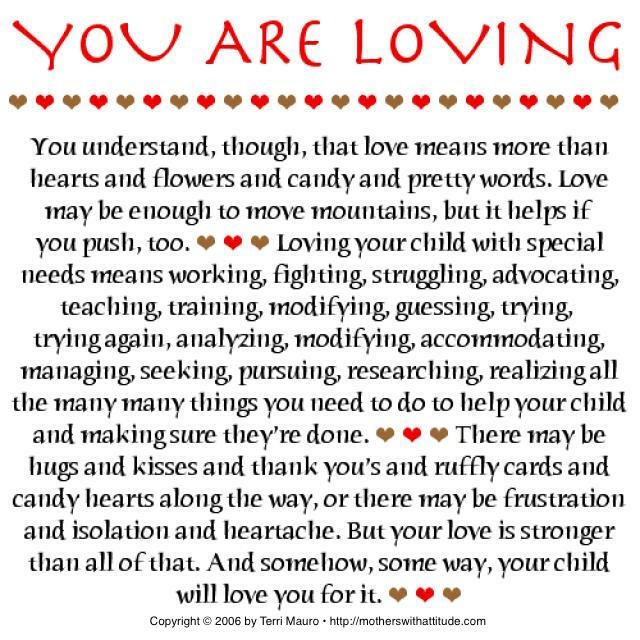 Loving your child with special needs means working, fighting, struggling, advocating, teaching, training, modifying, guessing, trying, trying again, analyzing, modifying, accommodating, managing, seeking, pursuing, researching, realizing all the many many things you need to do to help your child and making sure they're done. There may be hugs and kisses and thank you's and ruffly cards and candy hearts along the way, or there may be frustration and isolation and heartache. But your love is stronger than all of that. And somehow, some way, your child will love you for it. Feb. 15 ♥ YOU ARE UNDERSTANDING. 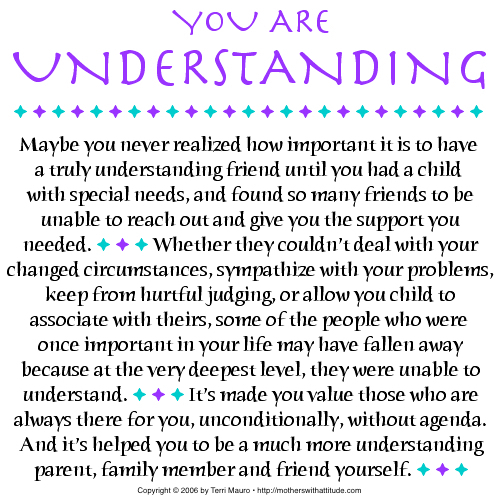 Maybe you never realized how important it is to have a truly understanding friend until you had a child with special needs, and found so many friends to be unable to reach out and give you the support you needed. Whether they couldn't deal with your changed circumstances, sympathize with your problems, keep from hurtful judging, or allow you child to associate with theirs, some of the people who were once important in your life may have fallen away because at the very deepest level, they were unable to understand. It's made you value those who are always there for you, unconditionally, without agenda. 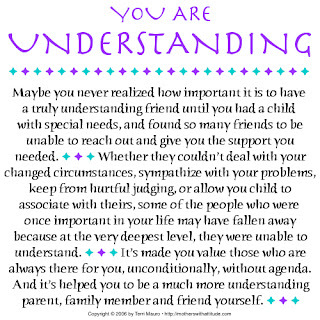 And it's helped you to be a much more understanding parent, family member and friend yourself. Feb. 16 ♥ YOU ARE TOUGH. 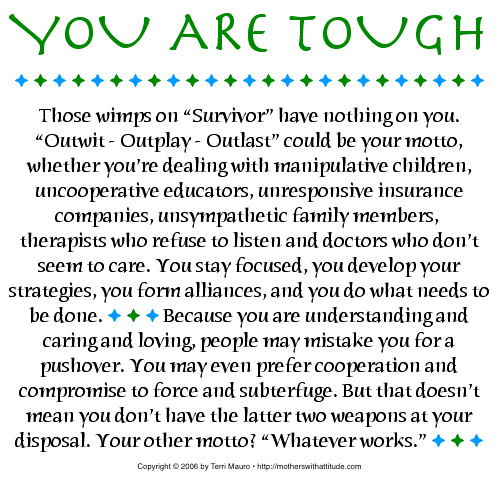 Those wimps on "Survivor" have nothing on you. 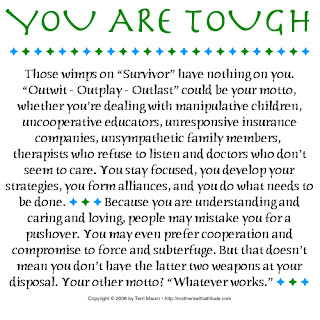 "Outwit - Outplay - Outlast" could be your motto, whether you're dealing with manipulative children, uncooperative educators, unresponsive insurance companies, unsympathetic family members, therapists who refuse to listen and doctors who don't seem to care. You stay focused, you develop your strategies, you form alliances, and you do what needs to be done. Because you are understanding and caring and loving, people may mistake you for a pushover. You may even prefer cooperation and compromise to force and subterfuge. But that doesn't mean you don't have the latter two weapons at your disposal. Your other motto? "Whatever works." Feb. 17 ♥ YOU KNOW WHAT YOU'RE DOING. Don't you? If not, you know how to make it look like you do. A little confidence goes a long way, and you can always fake it 'til you make it. The more you do, the more you realize that even the so-called "experts" are mostly just guessing and making it look good. Why shouldn't your guess be as good as theirs? 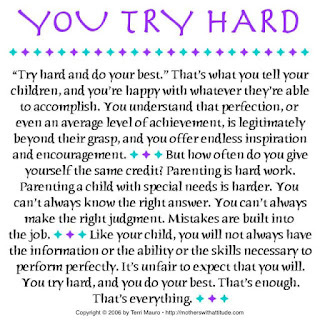 When it comes to parenting children with special needs, there are no hard-and-fast correct answers and smart moves, and trial and error is a perfectly acceptable method for finding solutions that work. The only thing worse than making a mistake is not making an effort. 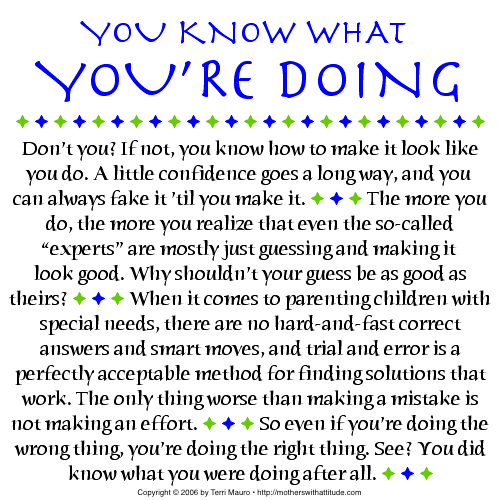 So even if you're doing the wrong thing, you're doing the right thing. See? You did know what you were doing after all. Feb. 18 ♥ YOU ARE TALENTED. Maybe you can sing or dance or paint or write; maybe not. 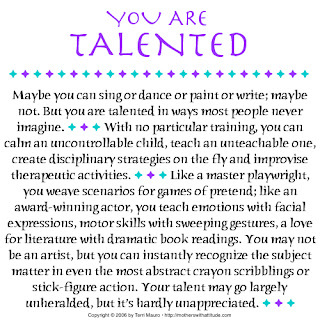 But you are talented in ways most people never imagine. With no particular training, you can calm an uncontrollable child, teach an unteachable one, create new disciplinary strategies on the fly and improvise therapeutic activities. Like a master playwright, you weave scenarios for games of pretend; like an award-winning actor, you teach emotions with facial expressions, motor skills with sweeping gestures, a love for literature with dramatic book readings. You may not be an artist, but you can instantly recognize the subject matter in even the most abstract crayon scribblings or stick-figure action. 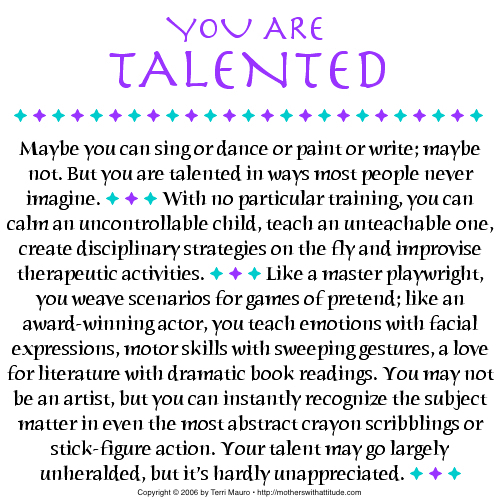 Your talent may go largely unheralded, but it's hardly unappreciated. 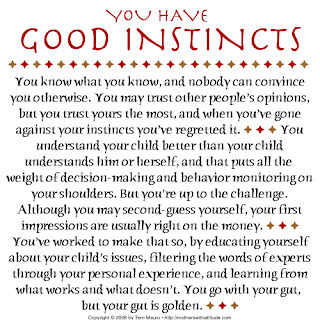 Feb. 19 ♥ YOU HAVE GOOD INSTINCTS. You know what you know, and nobody can convince you otherwise. You may trust other people's opinions, but you trust yours the most, and when you've gone against your instincts you've regretted it. You understand your child better than your child understands him or herself, and that puts all the weight of decision-making and behavior monitoring on your shoulders. But you're up to the challenge. Although you may second-guess yourself, your first impressions are usually right on the money. 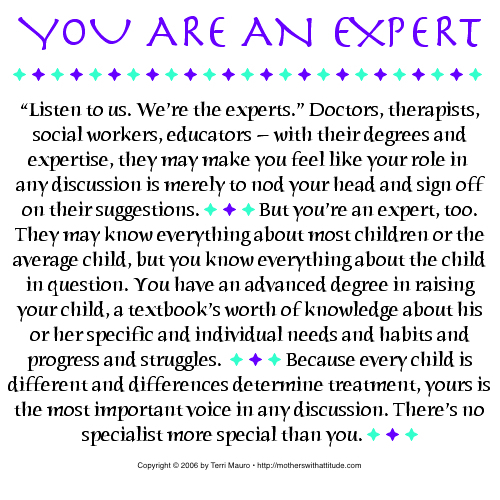 You've worked to make that so, by educating yourself about your child's issues, filtering the words of experts through your personal experience, and learning from what works and what doesn't. 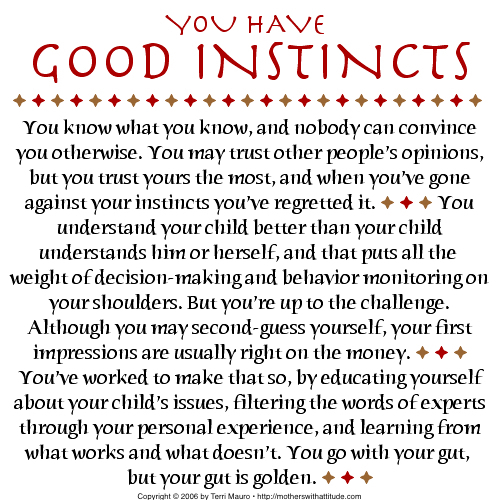 You go with your gut, but your gut is golden. Feb. 20 ♥ YOU HAVE SOMETHING TO SAY. 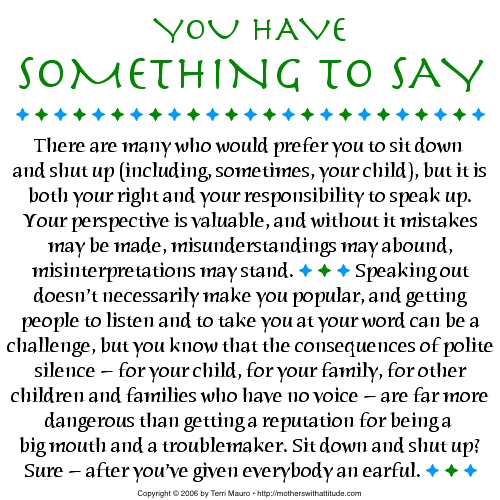 There are many who would prefer you to sit down and shut up (including, sometimes, your child), but it is both your right and your responsibility to speak up. Your perspective is valuable, and without it mistakes may be made, misunderstandings may abound, misinterpretations may stand. 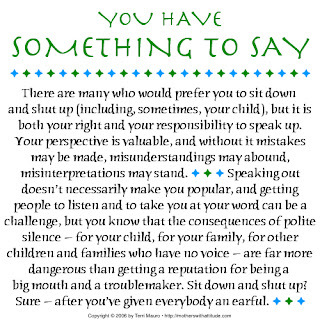 Speaking out doesn't necessarily make you popular, and getting people to listen and to take you at your word can be a challenge, but you know that the consequences of polite silence -- for your child, for your family, for other children and families who have no voice -- are far more dangerous than getting a reputation for being a big mouth and a troublemaker. Sit down and shut up? Sure -- after you've given everybody an earful. 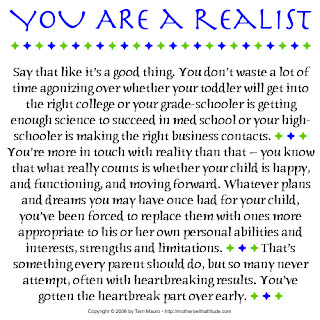 Feb. 21 ♥ YOU ARE A REALIST. Say that like it's a good thing. You don't waste a lot of time agonizing over whether your toddler will get into the right college or your grade-schooler is getting enough science to succed in med school or your high-schooler is making the right business contacts. 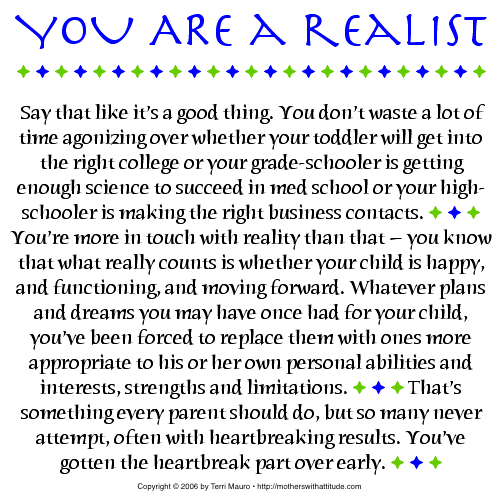 You're more in touch with reality than that -- you know that what really counts is whether your child is happy, and functioning, and moving forward. Whatever plans and dreams you may have once had for your child, you've been forced to replace them with ones more appropriate to his or her own personal abilities and interests, strengths and limitations. That's something every parent should do, but so many never attempt, often with heartbreaking results. You've gotten the heartbreak part over early. Feb. 22 ♥ YOU ARE INFORMED. 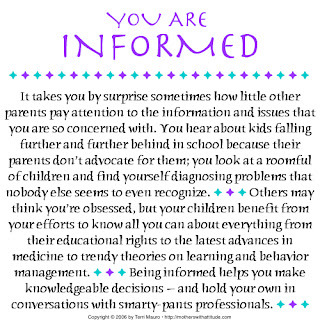 It takes you by surprise sometimes how little other parents pay attention to the information and issues that you are so concerned with. You hear about kids falling further and further behind in school because their parents don't advocate for them; you look at a roomful of children and find yourself diagnosing problems that nobody else seems to even recognize. 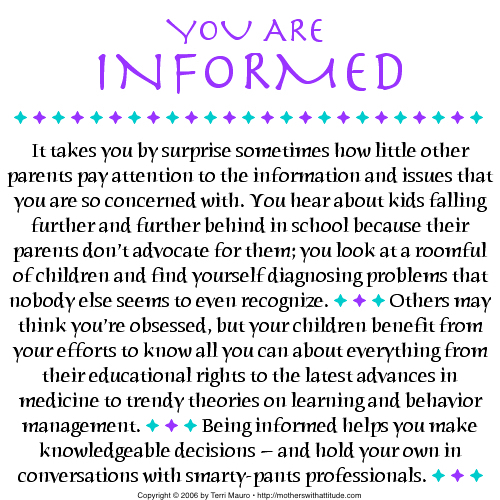 Others may think you're obsessed, but your children benefit from your efforts to know all you can about everything from their educational rights to the latest advances in medicine to trendy theories on learning and behavior management. Being informed helps you make knowledgeable decisions -- and hold your own in conversations with smarty-pants professionals. Feb. 23 ♥ YOU ARE NOT LAZY. You can't afford to be. 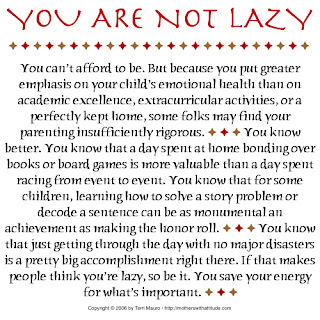 But because you put greater emphasis on your child's emotional health than on academic excellence, extracurricular activities, or a perfectly kept home, some folks may find your parenting insufficiently rigorous. You know better. You know that a day spent at home bonding over books or board games is more valuable than a day spent racing from event to event. You know that for some children, learning how to solve a story problem or decode a sentence can be as monumental an achievement as making the honor roll. You know that just getting through the day with no major disasters is a pretty big accomplishment right there. If that makes people think you're lazy, so be it. You save your energy for what's important. Feb. 24 ♥ YOU ARE FULL OF SURPRISES. That's certainly true when you're dealing with your child. You know that surprises can be a great way to motivate, amuse, distract and discipline, and you try to always have a big bag of tricks on hand. But you have the element of surprise going for you in other areas, too. Doctors may be surprised to find that you have strong opinions about your child's treatment, and have some facts and observations to back them up. School personnel may be surprised that you have solid, well-thought-out suggestions for how your child should be taught and handled, and have done your homework when it comes to your child's rights and the school's responsibilities. 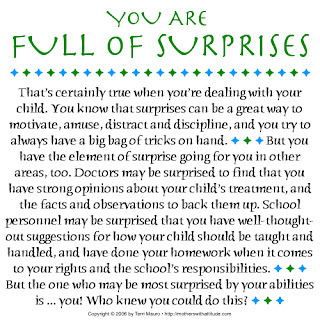 But the one who may be most surprised by your abilities is ... you! Who knew you could do this? 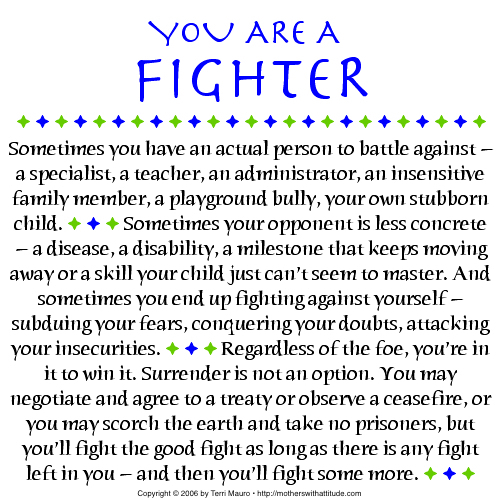 Feb. 25 ♥ YOU ARE A FIGHTER. 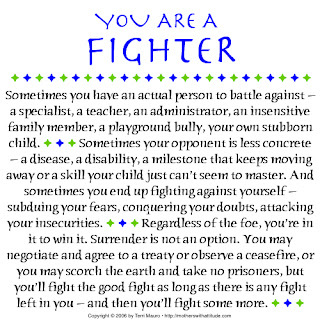 Sometimes you have an actual person to battle against -- a specialist, a teacher, an administrator, an insensitive family member, a playground bully, your own stubborn child. Sometimes your opponent is less concrete -- a disease, a disability, a milestone that keeps moving away or a skill your child just can't seem to master. And sometimes you end up fighting against yourself -- subduing your fears, conquering your doubts, attacking your insecurities. Regardless of the foe, you're in it to win it. Surrender is not an option. You may negotiate and agree to a treaty or observe a ceasefire, or you may scorch the earth and take no prisoners, but you'll fight the good fight as long as there is any fight left in you -- and then you'll fight some more. Feb. 26 ♥ YOU CARE. It would be so much easier if you didn't. If you didn't care how your child was doing in school, you wouldn't have to battle over homework or spend hours reviewing and reteaching. If you didn't care how your child behaved, you wouldn't have to keep finding new and improved disciplinary strategies. If you didn't care about your child's relationships, you wouldn't have to worry about social skills and awkward playdates. 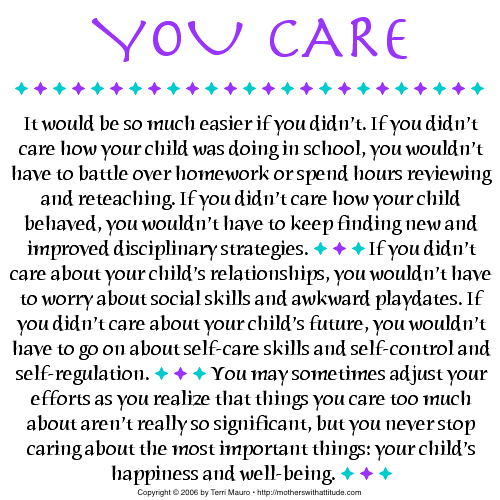 If you didn't care about your child's future, you wouldn't have to go on about self-care skills and self-control and self-regulation. 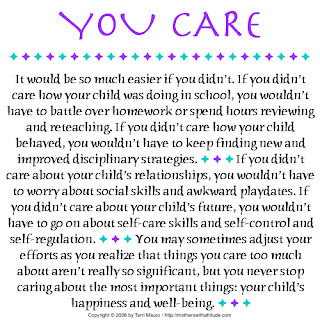 You may sometimes adjust your efforts as you realize that things you care too much about aren't really so significant, but you never stop caring about the most important things: your child's happiness and well-being. 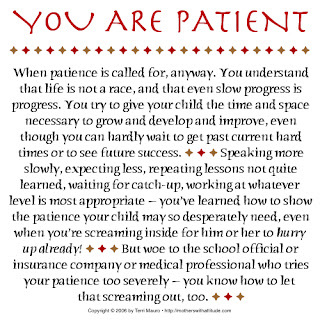 Feb. 27 ♥ YOU ARE PATIENT. When patience is called for, anyway. You understand that life is not a race, and that even slow progress is progress. You try to give your child the time and space necessary to grow and develop and improve, even though can hardly wait to get past current hard times or to see future success. 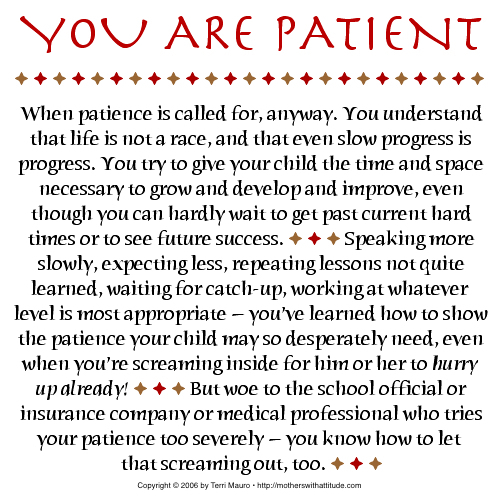 Speaking more slowly, expecting less, repeating lessons not quite learned, waiting for catch-up, working at whatever level is most appropriate -- you've learned how to show the patience your child may so desperately need, even when you're screaming inside for him or her to hurry up already! But woe to the school official or insurance company or medical professional who tries your patience too severely -- you know how to let that screaming out, too. Feb. 28 ♥ YOU ARE AN INSPIRATION. 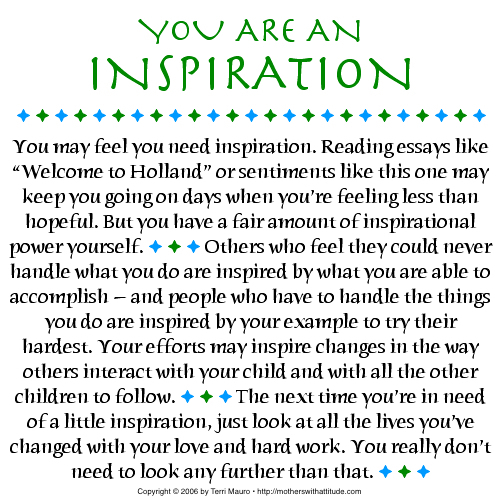 You may feel you need inspiration. 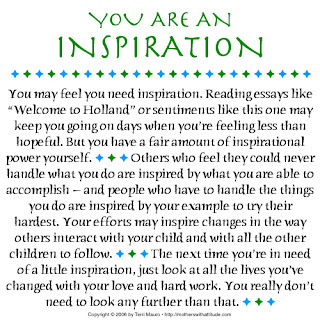 Reading essays like "Welcome to Holland" or "The Special Mother" or Web pages like this one may keep you going on days when you're feeling less than hopeful. But you have a fair amount of inspirational power yourself. Others who feel they could never handle what you do are inspired by what you are able to accomplish -- and people who have to handle the things you do are inspired by your example to try their hardest. Your efforts may inspire changes in the way others interact with your child and with all the other children to follow. The next time you're in need of a little inspiration, just look at all the lives you've changed with your love and hard work. You really don't need to look any further than that.